Despite starting from the opposite direction of Innsbruck, this course is in many ways similar to the one used for the men’s team time trial last Sunday. The first 30 km in the Inn Valley are predominantly flat before a challenging climb will break the rhythm. After the descent, the last part is up and down towards the finishing line. From the start in Rattenberg, the riders continue alongside the river until they reach Weer. As in the team time trial, this opening part is all about pushing big gears and keeping the pace high. However, it’s also crucial not to go too hard as you risk not having enough power to cope with the up-coming climb. In Fritzens, the terrain changes completely. From here on, the following 4.9 km towards Gnadenwald kick up with an average gradient of 7.1 % and include several parts of double-digits gradients. Especially the first half of the climb is steep. 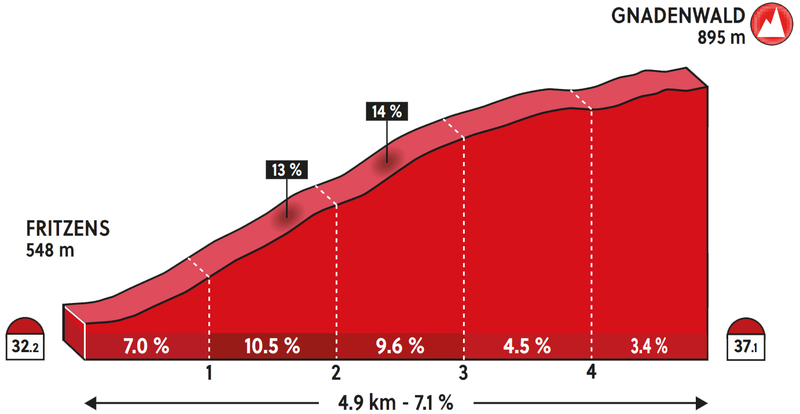 Going from a high pace onto such challenging percentages could easily break the legs of a few riders and put an end to their dreams of the rainbow jersey. In total, this route includes over 650 meters of climbing! From the top of the climb, there are still 16 km left to ride. The descent is fast but it’s followed by a couple of uphill parts to make the legs burn. After a final downhill section of 2.5 km, the riders cross the river again to take on the last flat kilometers towards the finishing line in Innsbruck. Last year, Tom Dumoulin proved to be in a league of his own when he won the rainbow jersey in Bergen, Norway with nearly one minute down to number two. It will be a huge surprise not to see the Dutchman on the podium again this year. Few riders can match his pace on the flat sections and having finished second overall in both Giro d’Italia and Tour de France this year, the climb is clearly no problem for him either. This course really suits his characteristics perfectly. After finishing fourth overall in Deutschland Tour last month, Dumoulin went on an altitude training camp to prepare for the World Championships and in Sunday’s TTT, he proved to be great shape as Sunweb took second place. The last four years have produced four different winners of the rainbow jersey. This time, it could very well be a familiar face on top of the podium. If not, the best pick to beat Dumoulin is Rohan Dennis. The Australian has taken a step up this year, focusing more on the general classification in stage races. It means he has improved significantly on the climbs but seemingly without losing any power in the time trials. Dennis has won every single ITT over 10 km this season. Amongst them, the two longs time trials in Giro d’Italia and Vuelta a España. In the Giro, he even beat Dumoulin. The World Championships is one of the biggest goals for Dennis this year and he has prepared meticulously for it. After acing the two time trials in the Vuelta he then withdrew from the race in order to fine-tune his preparation for the Worlds. Despite BMC only taking third place in the TTT, Dennis seems very confident ahead of the ITT. In the past, something has always happened to him in the big time trials. If he can avoid any bad luck, this may be the year everything finally works out for him. While it seems unlikely that anybody will be outdo both Dumoulin and Dennis on this course, we can’t rule it out completely. Just think back to the World Championships 2015 in Richmond, USA. Few, if any at all, had picked that podium. On top of it was Vasil Kiryienka. The Belarusian always perform well in a rested time trial and the longer the distance, the better it is for him. Kiryienka is known for making riders suffer when he goes to the front of the peloton and it’s no coincidence that FDJ once named their moto-pace scooter in training for Kiry. A completely flat course would have favored him more but let’s not forget that he has taken some of his biggest wins in the mountains. Kiryienka seemed to be in good shape during Sunday’s TTT where Team Sky finished fourth despite an unfortunate start. It will be a surprise to see Kiryienka repeat his winning performance from 2015 but another medal is definitely within his reach. Portugal’s Nelson Oliveira is also a serious podium candidate. The strong Movistar rider finished in fourth place last year, just seven second off the bronze medal. Oliveira is almost a Top10 guarantee in these kinds of long and challenging time trials – when he’s allowed to go flat out. This is not always the case at Movistar but now, nothing is holding him back. Recently, Oliveira was absolutely flying in Vuelta a España, working for his team leaders. Despite his hard work, he still managed to finish seventh in the long ITT, just 15 seconds down on second place. After getting closer and closer to the best time trialists in the world, this may be the year Oliveira makes it all the way onto the podium at a big championship. The two Germans, Max Schachmann and Tony Martin might also get close to the podium positions. Especially Schachmann should do well on this hard course, given his outstanding performances in Giro d’Italia earlier this year. The young Quick-Step rider is fresh off a win in the TTT and having finished third at the ITT European Championships last month, he’s definitely one to look out for. Riders like Bob Jungels, Jonathan Castroviejo and Victor Campenaerts should also be in the mix for the top positions in this time trial. This preview was kindly sponsored by London based website development agency Zodiac Media. Psst, what about Tom his teammate Wilco Kelderman?? Did surprise Tom during last year ITT nationals and rode a solid Vuelta after his “lost” season. Kelderman definitely has a shot at the podium as well if he’s on a good day. It’s very interesting that he has chosen to start so early. But looking at the results from the previous days, the early starters have been quite strong. Might be a smart call. Let’s see!